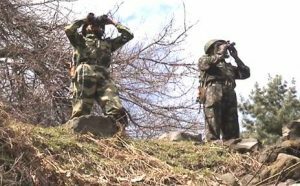 Pakistan forces again on Thursday violated ceasefire in Jammu and Kashmir’s Poonch sector. The security forces are retaliating strongly to the ceasefire violation by Pakistani army, officials said. India on Wednesday summoned Pakistan High Commission official and lodged a strong protest at the unprovoked ceasefire violation by Pakistan forces in Sunderbani Sector in Jammu and Kashmir. On Tuesday, a BSF personnel was killed when Pakistan troops fired and shelled along the International Border (IB) in Kathua district. On the same day Pakistan violated ceasefire along the LoC in Sunderbani sector. Earlier, an army major and a soldier were killed in an improvised explosive device (IED) blast along the LoC in Nowshera Sector of Rajouri district. “Our strong concerns were also shared at continued unprovoked firing and ceasefire violations across the Line of Control and the International Boundary,” the Ministry of External Affairs said in a statement.